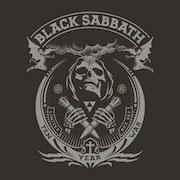 The first decade of Sabbath - all those brilliant early Ozzy albums - remastered and re-released in a lavish vinyl boxset. The Ten Year War, the lavish £195 new boxset of Black Sabbath’s first eight studio albums and a host of tacked-on goodies, is named after a pamphlet from 1978. That publication details the first decade of Black Sabbath’s history through excerpts of their tumultuous relationship with the press, of whom many were deeply opposed to the band. “Ozzie [sic] Osbourne and cohorts had the fans on their side from the off and, for the life of me, I couldn’t figure out why,” sniffs an early Melody Maker review in the admirably reproduced edition of the pamphlet that comes with this new boxset. Black Sabbath are denounced as “deplorable” by the critic Henry Edwards, who compares them to drain cleaner, and they’re doing nothing other than “testing the strength of speakers” according to The Sun. The boxset’s extensive paraphernalia also includes a reproduced tour programme from the 1978 anniversary tour, a crucifix/USB stick with all the music, posters and two reproduced ultra-rare 7” singles (the Japanese version of ‘Evil Woman…’ and the Chilean version of ‘Paranoid’). There’s also a lavish coffee-table book full of quotes about the group from such luminaries as Bon Scott, Trent Reznor, Slash and of course Chad from the Red Hot Chili Peppers. One quote in particular feels pertinent when revisiting the first decade of Black Sabbath. It’s from Scott Ian of Anthrax: “I always get the question, in every interview I do, ‘What are your top five metal albums?’ I make it easy for myself - I always say the first five Sabbath albums.” Personally I’d add the underrated, if flawed, Sabotage to Sabbath’s brilliant early run. Decades on, each record still sounds utterly killer. They’ve been remastered by MQA Audio, and though it’s best to spare you the details of how the format works, the sound is outstanding. Tony Iommi’s riffs and Ozzy’s soars of vocal, even to ears worn by decades of overfamiliarity, are reinvigorated with fresh, crisp power. But it’s Geezer Butler’s bass that benefits most. Take ‘Supernaut’ on Vol 4: however dazzling Iommi’s guitar noodling remains, the unholy stampeding chug of Butler is stunning to a level beyond even that. There remain of course, two runts of this particular litter: Technical Ecstasy and Never Say Die!. They were not good albums then, and they are not good albums now. Their inclusion still feels apt – they’re as much a part of Sabbath’s Ten Year War as any other record, and there’s a neat sense of closure as these releases the entirety of the Ozzy era - but it’d be hard to imagine many fans revisiting them. They’re rescued to an extent by the remastering – the colossal pomp of ‘You Won’t Change Me’ on Technical Ecstasy and the rollicking momentum of Never Say Die’s title track, for example – and they’re not quite the horror-shows they’re sometimes dismissed as. But not even this most stellar of reissues can quite redeem them. Apply that quality to the good albums, however, and the results are nothing short of magnificent. The Ten Year War is much more than simple vinyl fetishism – it’s the best Black Sabbath have ever sounded on record.